Back in Istanbul yet again! One week down and twenty-three to go. Actually, that’s not the way one really looks at time in Istanbul. It’s more like, “Oh, dear! I only have twenty-three weeks left!” Really. 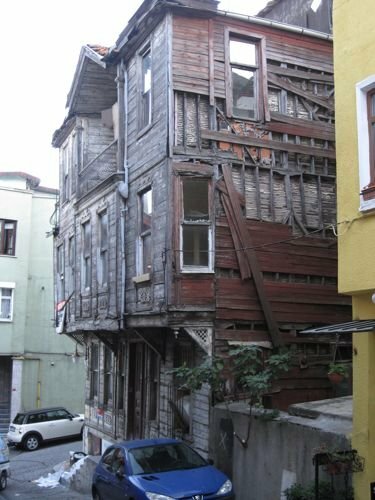 Having been stateside for over a year, returning to Istanbul was like coming back home. Libby and I were met at the airport by Adem, our kindly driver who delivered us to a spacious, bright, and breezy apartment—the best digs I’ve had in my years over here. I’m sub-letting it from a Robert College trustee who lives here in the summer, and she’s been more than kind in sharing her world as well as the name of her precious cleaner. I arrived in time for the third day of workshop, as I’d stayed behind for my nephew’s wedding in Boulder, Colorado. Since I missed his sister’s wedding a few years before, I enjoyed catching up with both of them and meeting their incredible partners. Ah, new beginnings! It’s taken me a week to catch up with the time difference (9 hours from Boulder), and I finally feel human as I enjoy the evening breezes wafting through the apartment. 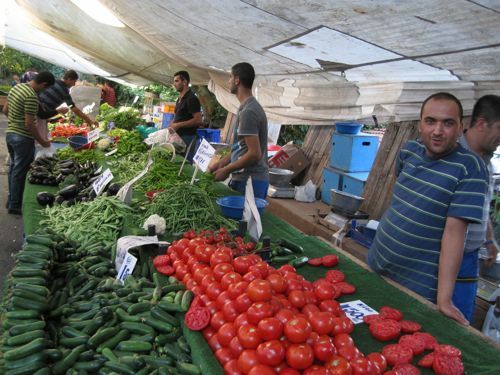 I just downed a delicious tomato sandwich, thanks to Arnavutköy’s Tuesday Street Market. The tomatoes were incredible—like the homegrown beefsteak tomatoes I remember from years ago. Each vegetable stand featured tomatoes sliced open to showcase their solid, red interiors, tomatoes you’d never find in a store (even here). I paid 1,5 TL a kilo, which comes out to about 40¢ a pound. Yup. Amazing, huh? And let me tell you, that tomato sandwich was DELICIOUS! 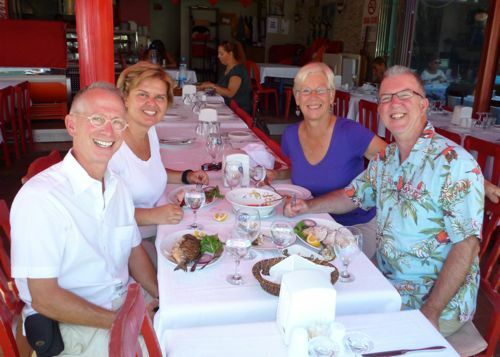 Last weekend Libby and I trekked to Burgazada with my friends Sandra and David and Sandra’s friend-of-a-friend from New York. Burgazada is one of the Princes Islands, located in the Sea of Marmara not far from Istanbul’s shore. It’s about an hour-long ferry ride, and we sat on outside benches to enjoy the warm air and stunning views of the city. 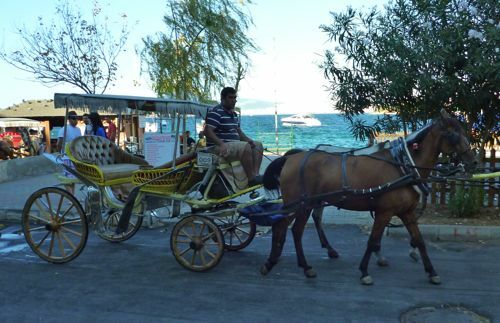 Cars aren’t allowed on the Prince’s islands, which makes for an idyllic setting. Horse carriages and wagons provide the only transportation, both taxis and delivery vehicles. We hiked up to Sandra’s apartment and relaxed on her balcony overlooking the sea as we sipped coffee and indulged in a variety of local pastries. My favorite was a sesame paste roll, much like a cinnamon bun. 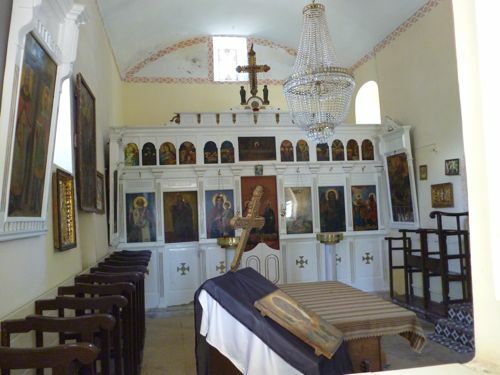 After that we trekked to the height of the island to visit an ancient “KILISE”—church, as well as a very sweet Greek Orthodox graveyard nearby. The big bonus on our hike, though, was a massive fig tree heavy with sweet, ripe figs, ours for the taking. Oh, my! 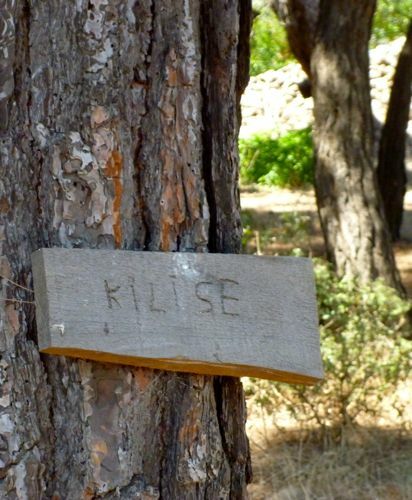 A rough sign below the church (kilise) on Burgazada’s hilltop. The interior of the Monastery of the Church of the Transfiguration of Christ. 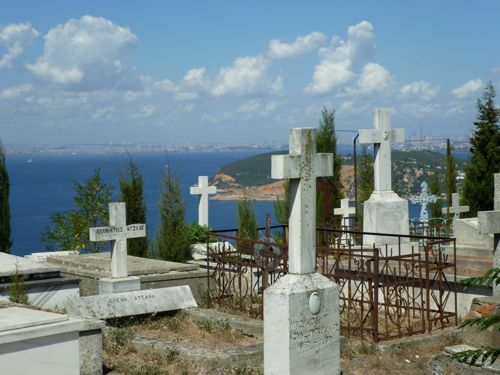 These ancient (and recent) graves overlook the Princes Islands and Istanbul in the distance. We hiked back down the island to the pier, where we sat in a shaded seaside cafe to spend two hours feasting on mezes (hors d’oeuvres), salad, and fresh-caught fish. YUM! Libby got only skin, which she didn’t mind a bit. Doug, Sandra, me and David revel in our fresh fish lunches. Of course, I’ve been working, too. School started Monday, and I love all three of my classes. Of course, most RC kids are incredible, which is probably why I keep agreeing to come back. They’re respectful, quiet, and diligent. Unfortunately, many are also sensitive. I’ve seen my share of tears, especially from a few who know very little English. This prep year is daunting for them, but they’ll all be on the same page by December. I often wonder how I’d react to being thrown into a classroom where we only spoke Turkish. ARAUGHHH!!!! It’s been a busy week, settling in, learning about our new ThinkPad computers, planning for my classes, and walking Libby a few times a day. I just stopped to get copies of my apartment keys, and I’m proud to say that I was able to communicate clearly with the anhatarçı (key maker) in Turkish.